I’m catching up on some reading this morning before our weekly partners’ meeting. In the mail was a report from Preqin, a highly respected firm that tracks the alternative assets industry. The graph charts various returns for a number of asset classes, indexed since 2000. 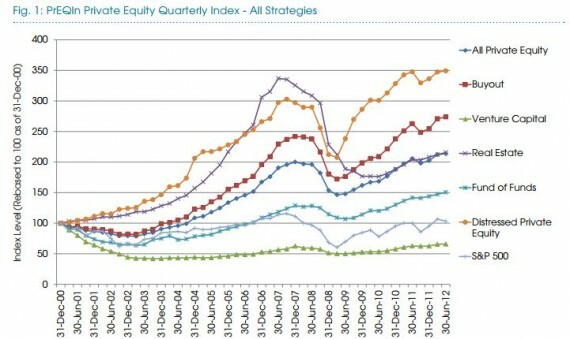 It shows that the leading strategy is “distressed private equity.” The laggard? Venture capital (the bright green line at the bottom). A lot of smart people have written about the how and why the VC industry has come to this point. For me, it ultimately boils down to this: venture capital doesn’t scale. As a founding partner of a VC firm, it can be tempting to “grow the firm” by adding headcount and assets under management. There are many strategic reasons to grow, but also, there’s a financial incentive to do so in the form of management fees. Over time, you can then find yourself with many partners at multiple offices, pursuing different investing strategies. I think that’s hard to pull off in VC. You’re backing a handful of people and concepts, with limited data. There are examples of large firms and funds that are very successful. But, I think every added new wrinkle makes a complicated business even more difficult to manage. On the other hand, something like leveraged buy-outs (which has done well, per the chart above) does scale. I spent one summer working at Bain Capital. It’s much easier to screen for investments when you’re all looking at a common set of spreadsheets. That’s a business that does scale. When you’re in the business of backing people’s dreams from scratch, there’s no substitute to being up close and personal. Beyond 4 or 5 partners, I think it becomes exponentially more difficult to communicate and to create alignment. I think the best VC multiples will come from small and focused partnerships. I’ve bet my career on that.